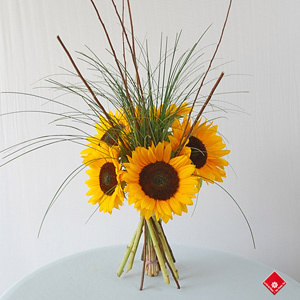 $10 off our Sunflower Bouquet? WOW! This week, The Flower Pot is celebrating the sunflower, America's "fleur par excellence", named for its sunny looks. They were first harvested in Mexico, and each part of the pretty flower has a different purpose. The petals can be used as cattle feed, and the fibrous stems, transformed into paper. In 16th century Europe, sunflower seeds and oil became very common cooking ingredients. For example, in Germany, sunflower seeds are mixed with rye flour to make bread. According to SELF magazine's Nutrition Data website, "this food is very low in Cholesterol and Sodium. It is also a good source of Pantothenic Acid, Phosphorus, Copper, Manganese and Selenium, and a very good source of Vitamin E (Alpha Tocopherol)." This week we're trying something new. For the 2012 sunflower season we're using social media to promote two types of coupons: an online coupon code, and a walk-in Foursquare discount. Both of those coupons provide discounts on the same wonderful Sunflower Bouquet pictured above. The discounts end on August 15th, 2010. The more people participate, the better! Join Foursquare and come visit our store at 1340 Notre Dame Ouest to redeem your coupon OR order online through our website and enter the following code: 20tournesol12. You can always call your friendly local Montreal florist located in Griffintown at 514-938-1234 if you have any questions!